Day of the Heroic Guerrilla is an annual observance dedicated to Che Guevara, a famous Marxist revolutionary who played a key role in the Cuban Revolution. It commemorates the day Che Guevara was captured in Bolivia in 1967. 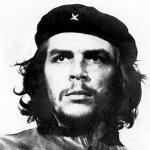 Ernesto Guevara, more widely known as Che Guevara or simply Che, was born on June 14, 1928, in Argentina. As a student, he traveled across South America, witnessing poverty and exploitation. This shaped his worldview as a revolutionary. In 1955, he met Raúl and Fidel Castro in Mexico City and joined them aboard the famous yacht Granma. Guevara fought alongside the Castro brothers during the Cuban Revolution. When Fidel Castro assumed power, Guevara performed a number of key roles in Castro's government. In 1965, he left Cuba to participate in the revolutionary movement in Congo and Bolivia. On October 8, 1967, Guevara was captured by the Bolivian Special Forces. His execution took place the following day. Day of the Heroic Guerrilla was established by Fidel Castro nine days after Guevara's execution. The nickname “Heroic Guerrilla” is a reference to the iconic photograph of Che Guevara known as Guerrillero Heroico. It was taken in 1960 by Alberto Korda. Day of the Heroic Guerrilla was created to honor the national hero of Cuba and recognize his contribution to the Cuban Revolution.